The Catholic Church requires that Catholic parents have their children baptized as soon after their birth as possible. Please do not delay baptism for social reasons! It is much more important that your child be given the new life of baptism, and sanctifying grace, than the baptism be delayed for any reason. For centuries it was the custom to baptize infants in the first week after their birth. Download the Baptism Information Form (below). Complete the form and then email, fax or mail the forms to the Parish Office. All required documents must be completed and received before any baptism may take place. It is the responsibility of the parents to insure that all documents are completed in a timely manner. If you have any questions, call the Parish Office at 859-525-6909 and speak to Jenny Kunst. First-time parents are required to meet with Deacon Larry. During this meeting Deacon Larry will provide information about the sacrament and hopefully give you an even greater appreciation of this sacrament. You will also be presented with suggestions on how to pass on the beliefs and values of the Catholic Church to your children. Detailed instructions regarding the selection of godparents will also be provided. Contact Jenny in the Parish Office at 859-525-6909 to schedule a meeting. Children over the age of 7 who wish to be baptized will be required to enroll either in Mary, Queen of Heaven School or in the Parish CCD program, or in the case of home-schooled children, to demonstrate sufficient understanding of the sacrament. Contact Deacon Larry (859-525-6909 or lkleisinger@mqhparish.com) so that he may coordinate the child’s progress, together with the parents and godparents toward receiving baptism. Children in high school and adults who desire baptism are required to go through the parish RCIA Program. Every child must have at least one godparent. Two godparents may be selected consisting of one man and one woman. The godparent is someone who supports the parents of the baptized child and provides a faithful witness and identity of what it is to be Catholic. As such, the Church allows only those persons who are fully initiated into the Catholic Faith. To be fully initiated means to have received all three sacraments of Initiation: Baptism, Holy Communion, and Confirmation. They must have reached their 16th birthday. In the case of a married person, they must have been married in a Catholic Church by an ordained clergy (priest or deacon). They cannot be under any canonical penalty in regards to the teachings of the Church. If the parents choose a baptized non-Catholic person to be present with the Catholic godparent they will be known as a Christian Witness, but will not hold the title of godparent. Godparents must be actively practicing their faith which means that they fulfill the precepts of the Church and are recommended by their pastor. If the godparent belongs to a parish other than Mary, Queen of Heaven, they must obtain a letter from their pastor stating that they meet all the criteria for becoming a Catholic godparent. All Catholic Godparents must complete the Godparent Information Form (below). Complete the Baptism Information Form. Call the Parish Office and register to attend a class. Select your godparents and have them complete the Godparent Information Form (below). After all paperwork has been submitted, schedule your baptism through the Parish Office. For those over the age of 7, contact Deacon Larry Kleisinger at 859-525-6909. 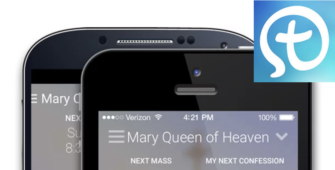 Get the MyParish App on your phone today and be the first to know about all the great things going on at Mary, Queen of Heaven Parish.